The harsh UK winters can certainly take their toll on various types of garden furniture be it wood, metal or even plastic. If you have room to store your furniture indoors then that's the best solution. However, before you buy a garden furniture cover or move it into the garage or shed here's some top tips for the cleaning and maintenance of your garden furniture during the winter months so that it looks as good as new when summer time arrives. Ideally you want to machine wash the cushions and seat pads but that's not always possible so make sure you read the label and care instructions before hand. If you can't run your cushion through a washing machine then sponge clean them and leave them to air dry. Cushions should always be stored indoors no in a shed or garage as they will get effected by the damp. Make sure they are dry before you store them away for the winter and don't store them in air tight containers. Sponge clean your parasol and leave it to dry in the sun on a breezy day. You should store this off ground level and where possible use a parasol cover. To keep your garden furniture looking pristine it's important that you clean off all the dirt that has built up over the summer before you cover it or put it into storage. To clean your furniture simply use a soapy water mix and a soft sponge. Rinse it with cold water when doen and allow it to dry in the sunlight. Aim to do this on a windy day where possible so it will dry even quicker. If you have an outdoor table and chairs set then you want to stack the chairs to save space / less to cover and put them in a shed or garage. If that's not possible move them into a sheltered area of the garden or close to an outside wall that doesn't usually bare the brunt of the winter weather. Ideally you'll want to invest in a garden furniture cover that's booth waterproof and resists UV light; it should be close fitting but enough to let the furniture breath and let air circulate, the last thing you want it mould and mildew. Like the chairs if you can store your table inside along with the chairs then that's always the best solution. If you don't have that facility or if it’s too heavy to move, cemented to the ground etc then store it under a waterproof cover and tie the cover to the bottom of each table leg to secure. Remember if you're keeping furniture outside then after any heavy rain or snow, you should always check that water has not gathered under the cover and dry everything off it necessary. If you have time remember to brush any snow or leaves etc to prevent it from getting damp and the dirt from building up. Make sure you buy covers that come with eyelets or some way of fastening the cover securely down so that the wind can’t blow it off. If you’ve already got the covers and they don’t have this feature, then look to secure them with something heavy such as some old bricks etc. Even with a garden furniture cover protecting your furniture it's always best to move your garden furniture into a sheltered part of the garden. If your furniture is left in an exposed area, then strong winds may blow it over or the cover can in some instances act like a sail. Try not to leave your furniture on the lawn and move it to a patio or decked area if possible, this will significantly reduce the furniture’s exposure to moisture and damp. If they have to stay on the lawn then try standing the table and chair legs on spare paving stones to keep them off ground level. There are so many different types of garden furniture on the market now that many of them require different cleaning and preparation, So how do you look after specific types of furniture and keep them looking like new for the summer? Timber garden furniture can be cleaned with a soft brush and special wood cleaner that you can snap up from any good DIY or local trade store. Remember once you have cleaned it, rinse it gently and allow to dry fully before applying a fresh coat of woodstain or outdoor gloss paint. Many gardeners and furniture retailers recommend a solution of 2 parts washing powder with 1 part bleach mixed with warm water. That can then be applied with a soft bristle brush to remove any surface dirt. Once clean then thoroughly rinse by spraying with a standard hose (pressure washers are too powerful) to remove any cleaner or any dirt the brushing has missed. We'd always recommend that you put wrought iron and steel patio furniture sets into storage for the winter. If you don't have that luxury then remember if you're covering your furniture make sure it's bone dry before you do it. Important: Some cheap furniture covers can promote mold or worse leak, so be careful and always buy quality garden furniture covers. The best way to clean synthetic and natural wicker and rattan is to vacuum it with the soft-brush attachment to remove any dust and debris from the weave, then wipe it down with a damp cloth. If its a natural wicker and it still looks bad, then you may have to lightly sand it. A coat of clear varnish is a good idea when working with natural wicker to protect the surface. Sunlight badly effect rattan furniture, so you should always cover it if you intend to leave it outside for more than two weeks at a time. Regular cleaning is recommended for natural wicker, as it generally cannot endure harsh or abrasive treatments and this will also minimize potential mildew buildup. Aluminum garden furniture will not rust because it develops an outer exterior known in the industry as ‘pitting’. This can be a little ugly but is very easy to clean off. To clean it use a nylon-bristled brush or broom. Once you have loosened any dirt simply hose it away. For a deepler clean use hot soapy water and a soft nylon-bristled brush or old toothbrush to scrub off any ingrained dirt that didn’t come off with the hose. Rinse with clean water. To finish you can polish and protect aluminum furniture with a soft cloth dipped in a water and vinegar solution. Avoid any abrasive materials that can scratch the aluminum. Plastic furniture is quite hardy so therefore can be cleaned pretty easily with a pressure washer. White outdoor patio furniture may need a bleach solution to keep it sparkling white. Make sure you’re wearing rubber gloves when using bleach because the chlorine can be very irritating to the skin. Turn the furniture upside down, if possible as midlew and dirt tends to collect here. You can use a toothbrush to get into any nooks and crannies. Once clean rinse the furniture as stated above plastic garden furniture can withstand the blast of a pressure washer. Dry with a soft cloth to prevent water spots. You can then finish it off with a coat of car wax for a water repellent shine. This entry was posted in How To Guides. Bookmark the permalink. Sam is in charge of the WheelieBinStorageDirect.co.uk website. 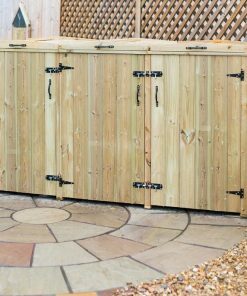 As well as maintaining all our product pages Sam regularly updates our buying guides section - talking about garden storage design, maintenance and a whole lot more. If you have a query please take a look at our in depth help centre where you'll find plenty of information about our products. Should you have a question that isn't answered or need some information on one of our wheelie bin storage solutions, please contact us below and we'll do our best to help. Best Gardening Gloves – Which Gardening Gloves Should You Buy? How Many Bins Do I Need? 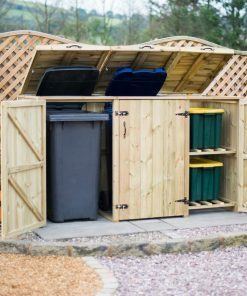 Wheelie Bin Storage Direct provide high quality wheelie bin stores. We specialise in well made timber products that last well into the future. Copyright 2012-2019 © Wheelie Bin Storage Direct.